Like most of you, I am bombarded (mostly by choice) with information from a variety of on-line sources. I subscribe to a wide selection of feeds in my Google Reader account and while I primarily "follow" educators in Twitter, they are very diverse in their interests and what they share. All sorts of ideas tend to percolate up. I save the ones that intrigue me most for a few days and then decide if they belong in more "permanent" storage (add to delicious account, blog...) or if I just need to let them go. But given this time to ruminate, I am often surprised at the various connections that are available out there. My big "A-ha!" for this week has to do with how the ability to share and create using tools from cyberspace is causing ethical questions in meatspace. Two things I saw last Sunday started my thinking, but it wasn't until a seemingly unrelated tweet was passed along Friday night that I finally made the connection. The first idea was posted by Will Richardson over at Weblogg-ed. He wrote about Our Kids as Criminals---a concept pulled from Lawrence Lessig's new book about "how we need to start rethinking traditional copyright law in the context of these easy sharing and copying technologies. And what’s especially relevant to our conversation is that he frames it in the way this all shakes out for our kids. In talking about how the government continues to create laws that 'wage war' against the copyright infringement that many youngsters engage in every day." In a world in which technology begs all of us to create and spread creative work differently from how it was created and spread before, what kind of moral platform will sustain our kids, when their ordinary behavior is deemed criminal? Who will they become? What other crimes will to them seem natural? I find this intriguing. There are lots of people out there (and of all ages) who are using 21st century tools to engage in incredible work that doesn't always follow the traditional rules. Is this okay? Should we ask them to conform to the "old ways," or do the rules need to be updated? And then Bora over at A Blog Around the Clock threw out this video of Clay Shirky speaking at the Web 2.0 Expo in New York. His point is that since the invention of the printing press, people have been complaining about "information overload," but maybe that isn't the right way to look at things. Perhaps we really need to be talking about "filter failure," or the ability to just get the information we want and need. Now, this is a long clip (~25 minutes), but certainly worth your time. The most interesting part for me is when Shirky talks about the "cheating via Facebook" scandal from earlier this year. (I blogged a bit about this, but again, it was Bora who really initiated this conversation.) The story goes something like this: a college student organized a study group for a chemistry class he was taking. The meetings took place on Facebook as opposed to in a library or someone's house. The university charged the student with over 100 counts of cheating. Here again, we've got some sort of moral dilemma when we mash up Web 2.0 technologies with the "real world." According to Shirky, the point of contention is not the formation of a study group itself. It is the number of people involved. You see, if you have a "live" study group, you will have to limit the number of attendees (only so many can sit around the table in the library) and the norms of the group will develop to prevent free loaders. It will be obvious if someone is showing up to just collect notes and ideas, but contributes nothing. In the cheating-by-Facebook case, the university contended that with well over 100 people in a group, there had to be at least one free-rider: someone who was therefore cheating and had been enabled to do so by the group's founder. And this is where my thoughts stopped on Sunday. I couldn't deny the possibility of free-riders as groups both increased in size and could also have nearly anonymous participation. And these are not traditionally operated groups---they are self-organized and directed, rather than managed in a top down way. And yet, I wasn't so sure that this whole Facebook thing qualified as "cheating." Take this blog, for example. In a real world sense, the content is "mine." I write it. I create the posts. However, I choose to share these ideas with you...and in doing so, I give up my ownership in some ways. Might someone cheat and "steal" my content and call it their own? Sure. I'm not sure what I could actually do about that...and I'm not convinced it would be worth the time and energy to do so. The only way for anyone---a blogger, an artist, a performer, and so forth---to retain exclusive rights to their work is simply not to share it with anyone. And what good is that? The second problem with the "free riding" frame is that it fails to appreciate that the sheer scale of the Internet changes the nature of collective action problems. With a traditional meatspace institution like a church, business or intramural sports league, it's essential that most participants "give back" in order for the collective effort to succeed. The concept of "free riding" emphasizes the fact that traditional offline institutions expect and require reciprocation from the majority of their members for their continued existence. A church in which only, say, one percent of members contributed financially wouldn't last long. Neither would an airline in which only one percent of the customers paid for their tickets. First of all, can I just say that this article has the best term I've read in a long time: meatspace institution. Maybe it's been out there for awhile and I've missed it. But I haven't seen anything which so ably captures the common drudgery of so many places and things. More importantly, however, the article makes a point that perhaps we're creating a problem where there isn't one: "We don't need to 'solve' the free rider problem because there are more than enough people out there for whom the act of contributing is its own reward." In other words, having an on-line study group of 100 people is not a moral issue because of the nature of cyber interactions. In the real world, you'd have a problem. We don't have to solve issues that don't really exist, in that sense. Using this blog again as an example, what this also means is that these new forms of media don't have participation as a requirement. I can choose to post a lesson plan I developed---but readers here neither have to comment nor share one of their own. It doesn't mean that you can't. It just means that we are each free to make our own choices about interactions here. It is not a 1:1 environment (as we might expect with a meatspace study group) and I don't think it would be functional if it was. That is the beauty and power of this type of space. Now, this doesn't take care of problems directly associated with copyright as the various spaces clash, but I can't help but think that there may be some lessons there. (And I may not be able to resist getting Lessig's book to see what he suggests.) At best, we can ask that people respect copyright laws (which vary from country to country---and in a cyber world I'm unsure how such borders would be determined). Enforce them? I don't know that they can be. Is someone going to prosecute every instance of filesharing, "right-click-saving" of graphics, cell phone camera captures of artwork? It's just not possible. That doesn't make copyright infringement okay by default, it just means that we are going to have to approach these issues in a way that makes sense. In the meantime, I'm starting to wonder what the future holds. Students don't need us to gather information for them. They don't necessarily need us to teach them about how to use web 2.0 tools. If we do provide them with a basic skill set, they will learn for themselves---differentiating resources and strategies to best suit their own needs. As educators, we will still have a large role in this, as well as helping students continue to improve. But I think it is already past the time where we will be able to reasonably impose meatspace rules in a way that makes sense for cyberspace activities. My basic philosophy of education is pretty simple: What happens in a classroom should be about every kid, every day. The needs of children should be at the center of every decision made at every level of the spectrum. The thing I am discovering (or perhaps confirming) is that all too often, the farther removed someone is from the classroom, the more likely it is that they want to make decisions based on the needs of adults, rather than students. I realize that as adults, we are responsible for making decisions on behalf of kids. I also realize that there are any number of viewpoints out there about what qualifies as "good" educational practice and so there will always be opinions to debate and satisfy during a decision-making process. I'm okay with that as long as people make their point on behalf of what they believe is best for kids and not themselves. I am finding that I am starting to be more up front with my philosophy. There is a lot happening with science education reform in this state. A lot of people want my ear. And what I am saying at the beginning of nearly every conversation is that statement of my philosophy: Every kid. Every day. I want them to know that if they're coming to me talking about personal/adult concerns, I an appreciate that, and am very willing to listen to whatever they have to share. I feel like it is fair, however, to be clear that unless they frame their comments around the needs of students, they will not carry much weight with me. I'm not sure this is the right thing to do. From a personal standpoint, it is. It is as true to myself as I can be. As for my professional role---should I be harder to read? Is it better to just take in all of the information and quietly make judgments later? Do we need leaders who appear centrist...or ones who are direct (even if you disagree with their viewpoint)? At some point, I will have to resolve this issue for myself. Whether or not I am overt in expressing my philosophy, it doesn't change that lens I'm using (or my frustrations with the selfish adults I meet along the way). And it doesn't change the need for every kid to have a positive learning experience in their classrooms every single day. It's that time again! It's Mole Day 2008! I may have a busy day of meetings ahead, but not so much that I can't make time to head over to the local Mole-Donald's at 6:02 a.m. to help kick off the festivities. Need more ideas for celebrating? Why not read the e-How guide or get some ideas from the National Mole Day Foundation (assuming their servers are back on-line). 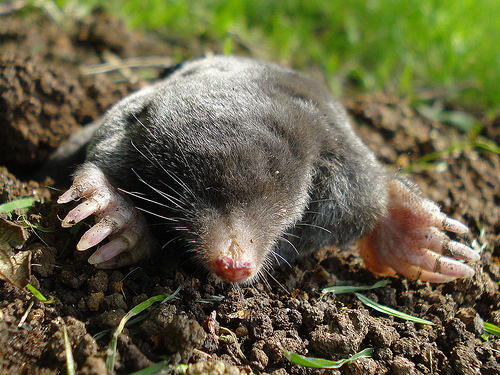 Come on, baby, let the good times mole! ASCD considers the issue of grade inflation at colleges and universities. "Teachers considered 'tough graders' risk poor evaluations and low course enrollment from students and losing institutional support from parents. Colleges like Wellesley and Princeton have enforced policies to raise the criteria for high grades, but so far, no widespread action has addressed grading inflation." I'm left wondering if the term grade inflation will still have a place in a standards-based world. I'm thinking it won't, but until then, higher ed is going to have some growing pains. In addition, ASCD points out Seven Reasons for Standards-Based Grading, but Jim over at 5/17 is keenly watching the implementation of these practices in a neighbouring district. While not specifically addressing grading, Polski3 is wondering about the possible impacts of Pre-Testing in the Classroom. I include a link here only because it does raise the question of what one might do if you discover there are students who are already at standard before you even begin a unit. Meanwhile, back at the WaPo Ranch, parents in a second county are claiming that the Grading Bar Is Too High. "A parent-led campaign to overhaul Fairfax County's grading scale has sparked a similar effort in neighboring Loudoun County. The Fairgrade group is seeking to lower the Fairfax school system's cutoff for an A from 94 points to 90 on a 100-point scale, arguing that the higher bar hurts competitiveness in college admissions and scholarships. Now the effort has traveled up the Potomac River as Fairgrade Loudoun tries to make a similar change to the Loudoun school system's 93-point A" Personally, I think the parents are concentrating on the wrong thing here. I'd like them to care more about what the grade represents than nitpicky points. Take your pick of the litter and click on over to join the fray! At the end of the school year, students at Garfield High School spend about 23 more hours in each academic class, roughly the equivalent of four more weeks of instruction, than students at Nathan Hale High, according to an analysis done by a parents group in West Seattle. The question is: Does that matter? "If one school district can do in two hours what it takes another six hours to do, and the students achieve equally well, then you have to ask what difference does it make," [Kathe Taylor] said. Marni Campbell, principal at Nathan Hale, agrees. "Raw minutes," she said, "is nowhere near the whole story." I agree, but is there some way to quantify the time needed for learning? The state has a 150-hour rule in terms of what qualifies as a full-year course, but schools can seek waivers. When I think about it, 150 hours doesn't sound like a lot, given the volume of curriculum. And how much of that did I "lose" as a teacher to student absences, pep assemblies, state mandated testing, and so forth? Did my upper middle-class kiddos need as much time to learn "biology" as those in a Title I school? If we could identify schools where students needed more time, would we support them with more money to help reach every kid? I understand the state's need to quantify things. They're ponying up the basic ed dollars and are charged with overseeing that access is equitable for students. However, I wonder if things like the 150-hour rule are what reinforce for some families that seat time is all that matters. I have had any number of students over the years tell me that their mom thinks they should pass the class because they showed up every day---it mattered not if anything was learned. How do we change the focus of our educational system from seat time to "enough" time to learn? I don't know that I really consider myself a visual thinker, but I do believe it's important in today's world to be able to use visual means to organize, track, and use all of the information that is available. I would love to dive into a conference like this to not only get new ideas for using the tools I know about---but to find new ways to use visualization. I am absolutely drooling over the idea of going to this conference: VizThink North America '09. There's no way I can afford it---even with $100 off coupon code, registration is $895...and that's before travel, accommodations, etc. Still a gal's gotta dream. Oh, Santa...do you know the way to San Jose? I have a statement to make. As of today, I will no longer resist the label of "techie," even though I don't think it suits me. I like to think of myself as "current." I was recently talking to a friend (who is a techie) about this---about how when I am introduced to people or when others describe me, the term "techie" is used. And not 10 minutes later when I had chatted with someone else, that third person introduced me as "This is SG...and she's techie!" when someone else entered the room. I looked at my friend, who smiled and shrugged her shoulders. I think the message was "Don't fight it." Is it really considered techie to know what blogs and wikis are? Use an aggregator like Google Reader? Understand how to connect one's laptop to an LCD projector? Text message from a cell phone? I had a teacher recently mention that she thinks I am a walking techie---and that I can just point my finger at things and make it happen. I had to giggle with that statement. Picard, I am not. Current? I'm trying. Maybe I should define that some more. Earlier in my career---in the distant "B.T" days---I tried to stay current by going to a conference and/or subscribing to a journal or two. There's nothing wrong with these approaches now, as long as the goal is to simply absorb information. My opinion is that with the opportunities to share and create that we now have with "web 2.0" tools and social networking, that we can be more than just sponges. We should expect more from ourselves as educators. My view of being currency now is that it I need to do more than "know." I need to be able to "do." I'm starting to think that I may well be in the minority on this. So, I'm giving up on trying to explain to others that I'm not techie. I don't have magic fingers or some secret store of knowledge that is only available to me. If technology in all its forms is the currency of the realm, then I will keep doing what I can to enrich myself and others. I hate to say it, but this could just about be my cubicle at work. There's been a lot of shuffling of offices and other things...and each day, when I come in, there are even more boxes piled up around me. Not to mention that my large table space for working was taken away...and I'm supposed to remove my resource materials from the shelves and take them home. In other words, I can't work at work. And with state-wide budget issues, I don't think I'm ever going to be provided with a stapler (much less a red Swingline) so Milton here is one up on me. It is times like these that I long for a classroom again with space to use my tools of the trade. I do like the work I'm doing and the world I'm moving in---so perhaps all of this is a sign that I need to push further into the digital realm and get to a point where I just need my trusty laptop and an aircard to be able to work. What about you? How's your office space these days? I've been on the road all week---and am away again tomorrow. What a long strange trip it's been, too. While I catch my breath and try to capture some thoughts to share with you, why not click on over to this week's Carnival of Education? It's hosted by Eduwonkette, who's cleverly included posts into a debate format. Be well read and entertained simultaneously! Do you use Cloud Computing? The term refers to data storage (documents and other files) that are stored on a server that you don't own. For example, if you use GoogleDocs, you are putting your information in the Cloud. This can be handy---you have access to your information from anywhere and can work from any computer. On the other hand, if a company goes under, changes their policy, or their server has issues, you're in a heap of trouble. (Just ask the people who "bought" music from Wal-Mart's on-line store...only to find out now that Wal-Mart is discontinuing the service and customers will have to repurchase their music from someone else.) Cloud computing can also have some interesting consequences for those groups which have legal records retention requirements. What do you do if you're audited? However, might the Cloud have some benefits for educational institutions? It's inexpensive and can host many different kinds of educational software. While the verdict might not be in as to Cloud Computing, I have to say that I enjoy making use of it. At this time, I don't store any critical or personal information there---I'm entirely trusting. But it's a great feature to be able to plan and share with others, or keep a spare copy of some documents. Like the evolution of cell phones in the classroom, I am wondering if students will drive a change in using the Cloud. Did you know that it's National Metric Week here in the states? Better yet, today is Metric Day (10/10). The National Council for Teachers of Mathematics has lots of ideas for celebrating, as does the U.S. Metric Association. Get out and party with your liters, meters, and degrees Kelvin. If you haven't been keeping up with Liz Kolb's From Toy to Tool: Cell Phones in Learning blog, I strongly encourage you to go have a read. I used to say that I didn't want to do anything with my cell phone other than make and receive a few calls, but in the last several months, I've been very happy to discover (and use) many other features. Whether it's capturing posters at workshops (and sending to Evernote), keeping up with friends via text messaging, or showing off Poll Everywhere at a workshop---these are quite the versatile tools. Meanwhile, "Acceptable Use Policies" in schools aren't necessarily keeping up. And, as Teacher Magazine points, out, schools are having to find ways to accommodate cell phones. I can't help that as features continue to be added (according to Liz, phones can now be purchased that have LCD projectors attached...and within 2 years, most/all phones will have broadband/DSL access and file storage), schools are going to have to find a way to make their peace and put phones to work in the classroom. Do We Know It When We See It? I tend to blaze through my feeds in Google Reader each day, saving a few that pique my interest and require further thought until the weekend. As I sorted through the stash this morning, a couple of items connected for me. Education Week is asking Where Has All the Knowledge Gone? in reference to best practices in math instruction. They claim that "the sorry state of math education...is not due to schools or teachers, but to the dangerous suppression of research knowledge about ways to teach math well." In April 2006, President Bush announced that a panel of experts would conduct a review of research into the effectiveness of different mathematics approaches. The formation of a “national math panel’’ seemed positive, but the Bush administration told the group it could only consult research that used randomized controlled trials. This caused a serious problem, simply because educational researchers rarely ever use such experiments. Randomized controlled trials are expensive, and they pose problems for teachers, many of whom are unwilling to treat children as experimental subjects. Instead, education researchers typically conduct “natural experiments,” which compare teaching approaches not by sorting children into control and experimental groups and then applying “treatments,” but by finding schools that use different approaches and studying their effectiveness. A number of these experiments have been conducted; they have provided consistent and important evidence, and have been published in peer-reviewed scientific journals. Yet the math panel was forced to ignore all of them and search instead for randomized trials. Consequently, in the critical section of its report investigating the differences between teaching approaches, the panel found only eight studies to consult. All of these had followed students only for a small number of days, and most of the researchers had found, unsurprisingly, that the different approaches had made no impact. The thing that makes educational research so difficult is simply that it is done on people---children, at that. While randomized control trials (done well) could form the basis of some exceptional research, they also bring up some ethical issues. Can we really justify withholding "treatment" from some kids? Instead, ed researchers tend to look for different types of programs already in place and compare them for efficacy. Certainly, one may well be better than the other; but in these cases, it is not the researcher who is making the choice. Teachers and schools are doing what they believe is the best course of action on behalf of their students. The point of the Education Week article is that last spring's report that was issued by the National Math Panel---a report being looked at and taken very seriously by many districts---is not based on an appropriate picture of what is really happening in schools. Does that make the Panel not so bright...or us for even listening to what they say? Meanwhile, ASCD wonders if it's today's students who represent the dumb ones. Are the millions of people born between 1982 and 2000 part of an intellectually devoid generation? That's what Emory University professor and author Mark Bauerlein argued at the American Enterprise Institute on Monday during a debate with Neil Howe. Bauerlein claimed there is a decline in knowledge skills and intellectual learning among young people, pointing out the scores of students who have to take remedial courses in college and the average number of hours they spend surfing the Internet, playing video games, and watching television. He said the explosion of social networking using technology has led to young people becoming obsessed with their social lives. Instead of reading great literary works like The Divine Comedy or 1984, today's young people are reading their comments on Facebook, leading to stunted character development. Um, wow. I'd actually like to find a transcript of this debate. I tend to think that today's teenagers are no more or less "obsessed" with their social lives than previous generations of teens---they just have different options for expressing that. Does anyone really believe that our parents and grandparents were just dying to get home from school so they could read Dante---as opposed to hanging out with their friends? At the core of Bauerlein's argument is the idea that there are certain pieces of knowledge which qualify one as being an intellectual. I'm not so sure I can agree with that. I think there are all different kinds of "smart" out there---whether we're talking about those who have common sense, to thinkers and dreamers, to those who solve problems (from the local mechanic to political types). Just because someone hasn't read 1984 and/or has a MySpace page is not reason enough to think of him/her as belonging to a Dumbed-Down Generation. Scanning the comments on this article, I see that I'm not the only one. All of this makes we wonder if Knowledge has really gone the way of the dodo, or perhaps if we don't know "smart" when we see it. I was at a workshop earlier this week. It was held in a hotel with several other events and groups engaged in their own work. At various moments, I found myself charged with watching our registration table. This was the perfect opportunity to people watch some of the other groups. Two particular men caught my attention---mainly because their behavior reminded me so much of some of the teens I used to work with. I had no trouble envisioning these guys as their student selves. The first man I ended up seeing several times. Sure enough, as soon as lunch or break was over, he could be found wandering around in the halls...sometimes talking on a cell phone, but more often than not, just hanging out. I talked to him a couple of times, finally shooing him "back to class." I couldn't help but think that this was the kid who would always ask if he could go to the bathroom/locker/nurse/office to call mom every time there was work to be done in the classroom. This was the "frequent flyer"---the kid who tried to wrangle a hall pass every class period---and knew the longest route to every bathroom in the school. There he was, all growed up. The other man was once a gifted boy, too smart to be left to his own devices. Not that he would do anything malicious, but so creative in his thinking that you know that when he starts getting quiet, trouble is brewing. Meanwhile, he likes to say things to test the boundaries---to see if you'll call him on the bull he occasionally spouts. He wants to know whether or not you're paying attention. And now? His behaviors are mature, but there is that gleam of mischief in his eyes. It made me laugh to see him---I didn't laugh at him, mind you. It was just the remembrance of students I had like this and being delighted that they might have turned into this type of grown-up. When I've worked with adults in the past, I have rarely (if ever) thought about what their high school selves might have been like. Most of the time, the person I see in front of me has worked hard to mask earlier versions of the self. But these cases this week make me smile. I can't help but think that these men have known who they are for a long time, are comfortable with that, and happy with how they fit with the world. Perhaps we should all strive for that kind of security thoughout our lives. Be sure to head on over to Mathew Needleman's place today to visit this week's Carnival of Education. I'm busy busy with ~60 other educators today, but am looking forward to joining you on the midway later. Someone save me a caramel apple!